Sometimes comic books are not only meant to entertain but to challenge and provoke thought. 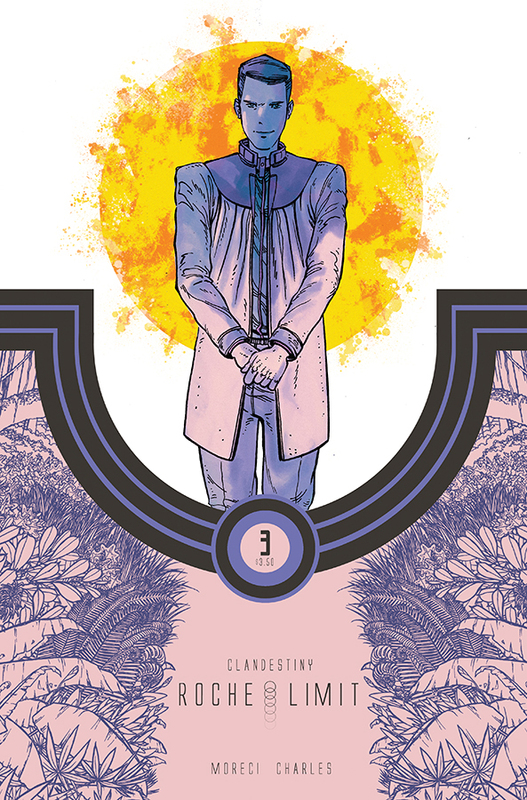 Roche Limit Clandestiny #3 and the series itself is that kind of sci-fi comic book. It has deeper thoughts than your average space adventure.Yet, writer Michael Moreci expertly blends horror into this existential crisis that grips the crew left on Dispater. "What is reality?" That is a pretty heady question for a comic, but it hangs over the issue like a storm cloud as the situation begins to deteriorate. The philosophical debate that takes place influences what we see occur. Since the forest uses a person's desires, passions or fears against them, is it real or a manifestation only in the mind. Sasha and Danny tackle these ideas and even though he may be working on his own agenda he may be the only one making sense. Things begin to go sideways and Kyle Charles' distressed linework is the perfect vehicle to depict the frenzy of terror that awaits some of the characters. Charles can express despair and desolation with wide expansive landscapes that seem unyielding making the characters seem small and insignificant by comparison. Yet, it makes their conversation about where they fit in this world all the more poignant. Matt Battaglia's colors take the art to another level. It not only compliments Charles' pencil work it breathes life into it. From the beginning, the color purple plays a role in the story as a stalking menace that is ever present. Whether it's a darkening sky or a beast, purple becomes a harbinger of death or terror. Battaglia uses colors to tell the story as well as the words or the ink. Roche Limit Clandestiny #3 is the game-changing issue that lays out the conflict from a philosophical and violence standpoint. It asks much from the reader to grasp and ponder while the horror manifests itself in different ways. Charles and Battaglia illustrate the tension and anxiety with the touch of virtuosos. If such a thing as a "thinking man's sci-fi comic" exists this would be it.